In a day-long hearing, university presidents and chancellors said their schools might have to lay off faculty and cut classes if hundreds of millions of dollars worth of "special items" aren't put back in the budget. The president of Texas Woman's University said hundreds of classes would have to be cut if the current version of the Senate' proposed budget is implemented. The dean of Texas A&M University's Health Science Center said her school would be forced to reduce enrollment and might see its accreditation threatened. And many university presidents warned that they would have to lay off faculty. On Wednesday, higher education leaders painted a bleak picture of what would happen if the Texas Legislature eliminates a budgeting maneuver that allocates money to universities outside the standard funding formulas. The Senate's first crack at the budget includes almost none of the "special items." If that were to hold, more than $1.1 billion in higher education funding would be wiped out. Some schools would probably have to close, presidents said. "The sky really is going to fall if you pass this bill," said Texas A&M University System Chancellor John Sharp. But the Senate's chief budget writer, Sen. Jane Nelson, R-Flower Mound, tried to put the presidents and chancellors at ease. As she kicked off the day's proceedings, she noted that at least some of the special items would be restored. Right now, there is about $300 million available in the current version of the Senate's 2018-19 budget for the items. More could be found later, she said. And either way, the final version of the Senate's budget will have to be reconciled with the one passed by the House. In the lower chamber's first crack at the spending plan, special items were essentially continued as normal. But university leaders were still on edge. The hearing lasted into the evening, with hours of testimony from officials from Texas Woman's University and Texas A&M University System schools. University of Houston System and Texas State University System leaders were still waiting their turn as night fell. The rest of the state's systems, including the University of Texas System, are scheduled to speak Thursday. Even if the $300 million is added back in, the Senate would be eliminating about $800 million in special items for higher education. Cuts of that amount would certainly be felt at schools across the state, university officials said. Still, Senate leaders have stressed that special items need to be addressed. "These costs have grown exponentially over the years, and I do believe that a top-to-bottom review is in order," Nelson said. Special items are used to found higher education in several different ways. They allocate money to fund museums, research programs and small business development centers that have little impact on students. They are used to create new programs and majors. And they are also used to supplement the state's formula funding to allow schools to hire more professors and staff. But critics in the Senate say the items are problematic. Often, a special item designed to start up a program isn't removed once the program is up and running. The oldest special item in the current budget dates back to 1909. And senators said some schools have programs that are essentially funded twice — once through special items and once through the standard formula funding. Nonetheless, any special item eliminations would result in less money going into universities. And that is a scary thought to university presidents, who have dealt with reductions in per-student funding in recent years. Most who spoke Wednesday raised the possibility of reductions in staff, faculty and maybe even enrollment. 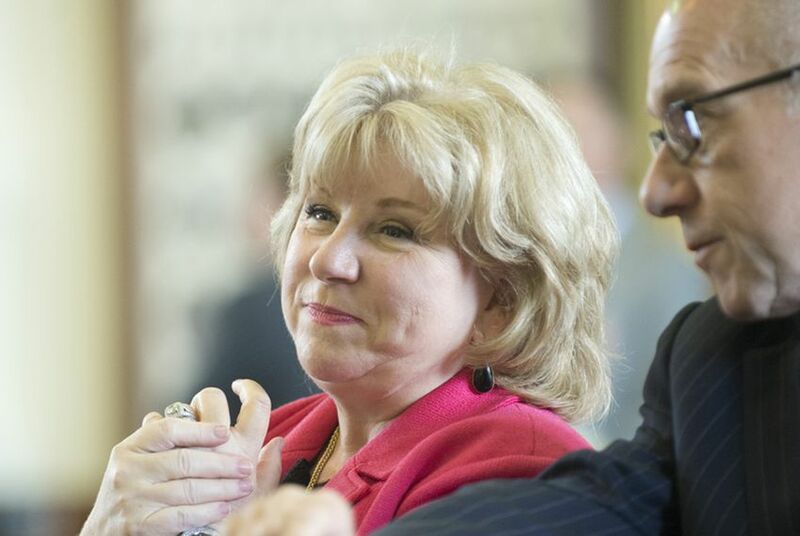 Texas A&M University-San Antonio President Cynthia Teniente-Matson called those cuts potentially "catastrophic." After many presidents and chancellors spoke, Nelson asked them to say which special item was most important to their schools. Most answered with an item known as "institutional enhancement," which in many cases is the biggest item each school receives. Those items were added to schools' budgets in 1999 to essentially supplement the funding they received through state formulas. "Special items — as you have heard from all of my colleagues — are a method of core funding for our core offerings," said Texas A&M University-Commerce President Ray Keck. He later added, "If this money goes away, we don't have a way to replace it and will have to lay off faculty." Nelson said she understood these concerns. But the state faces a difficult budget period, with less money in general revenue available to spend than the two years prior. "This session, we have to prioritize," she said. "And I think we have to prioritize students." Once the hearing is over, Nelson will convene a working group to begin figuring out how many of the items can be preserved. "I want this working group to sit and look at all these special items and look at the fact that we have $300 million in the budget, and how do we do this?" she said. "How do we make this work?" Disclosure: The Texas A&M University System, the Texas State University System and the University of Houston System have been financial supporters of The Texas Tribune. A complete list of Tribune donors and sponsors can be viewed here.